On August 21 2017, people from around the world will travel to the heartland of the United States to experience its first total solar eclipse in 38 years. Certified by NASA as the best location to enjoy this unforgettable event, as many as 200,000 people will witness the greatest duration of eclipse totality in a precise 70-mile sweet spot of southern Illinois. For a captivating 2 minutes and 41.6 seconds, the eclipse will reach its maximum duration over Makanda, IL, a small village seven miles south of Carbondale in the hills of Shawnee National Forest. Solar eclipse enthusiasts should take note of this small but significant village, as Makanda will also be in the central path of the next total solar eclipse on April 2, 2024. On average, a total solar eclipse occurs at any one spot on the Earth just three times every 1,000 years – making the village of Makanda a twice-in-a-millennium phenomenon destination. The second largest solar eclipse duration will take place in Carbondale, IL, lasting for 2 minutes and 38 seconds. Carbondale has been preparing for this historic eclipse for more than three years. During the five days leading up to the eclipse, visitors can enjoy a special carnival, Comic-Con, arts and crafts fair, science and technology expo, and space science activities from Chicago's esteemed Adler Planetarium. Additionally, visitors can attend a variety of solar eclipse talks, panel discussions and activities related to this once-every-thousand-year spectacle. For more solar eclipse excitement, Illinois residents and visitors are invited to attend the first-of-its-kind Moonstock 2017. 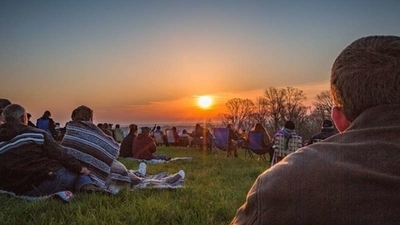 Located at Walker's Bluff vineyard, approximately 20-miles north of Makanda, this four-day music festival features acclaimed rock and heavy metal bands, including the legendary Ozzy Osbourne performing his iconic 1983 hit “Bark at the Moon” as the lunar shadow lands on Southern Illinois. Solar eclipse spectators can anticipate experiencing the disk of the moon blocking-out the last sliver of light from the sun, as the area inside the moon's shadow is cloaked in twilight and the sun's outer atmosphere - the corona - becomes visible. Before and after totality, observers will see this cloak of darkness move towards them across the landscape.